Sadie Scottâ€™s childhood was less than pleasant. Raised by a cruel aunt, she and her sister, Suzie, finally get away and begin building their lives anew. 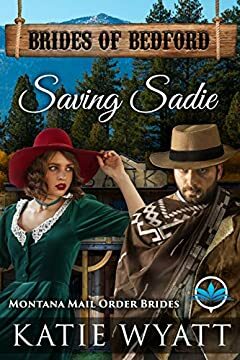 When Sadie falls in love with a Montana man, Chester Hill, through the mail, and agrees to be his bride, sheâ€™s excited to start out on a whole new path. But, while waiting for her sister to join her on the train, Sadie is horrified when Suzie never shows, and the train departs. Then, when Sadie arrives in Montana, her joy at finally meeting Chester is offset by a terrible threat to Suzieâ€™s life. Will she ever find someone to help her? Can she find a way toÂ trust Chester not just with her heart but with Suzieâ€™s life? Will Sadie ever see her sister again? Read all the Books by bestselling author Katie Wyatt! American Mail order brides Sweet Frontier Cowboys Complete Series (20 Book Series) Full-Novel Romance. Katie Wyatt Clean and Wholesome novelette American Mail Order Bride historical Western romance series is enjoyable for all ages.